More like NOTN really, as you will see from my pic. This seemed like a mauve-purple tinted maroon (well that's how it looked to me) in the bottle. Turns out it's a dark brown-maroon colour, not really a favorite with anyone, but it does brighten my fingers so I am not complaining. Plus, it costs around Rs. 40, and with daily typing and some kitchen work it survives about 3-4 days without chipping! I'm so in love with these Rads. On my hands they stay put for so long without chiiping. Perhaps this is the only nail polish that doesnt chip very quickly on my hands! 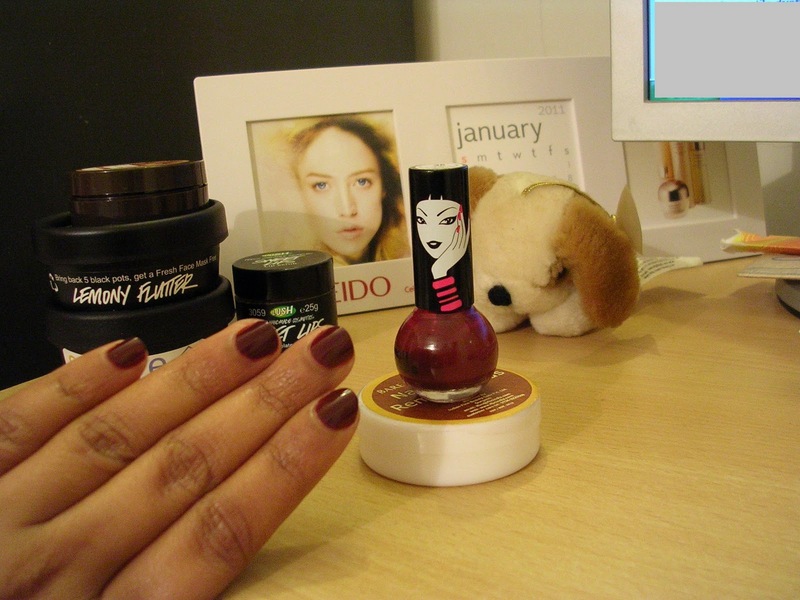 Hi Nivedita :) True..it seems a very decent nail polish, especially for the price. I do wish they come up with some more colours - the few that I saw were all too shimmery and pretty strange colours :P :P And they don't seem to be available in many places. as usual the pcitures u take are GREAT!!!!!!!!! I have a red too..forgot the number..oh and I hate the number thing..some kind of a name is so much better, I feel! When I saw your post title what popped in my mind was..'its more a NOTM' and had you not said yourself (NOTN??? ), I would not have mentioned it..out of delicacy you see :D:D....but that color looks so good on you..your hand reminds me of a tips & toes nail paint ad. I saw years and years back..
Nighttt...OMG..and I said NOTM (month)....ooops..
dis looks so pretty on ur fingers..me like...!! Think it looks nice on your nails and yes dark colour nail paints do make your hands look a little 'fairer'. I love my reds and browns! Hi Priya!! :D yeaaaaaaaaaayyyeee..me feeling soooper happy..These fridays..I reallyyyy loveeeee.....Whole day I feel so excited...he he he he!! :P :P What are your plans for weekend? Hey Radsu..........I pick up a lot of these colours....you have shorty cutey nails like me.....what's the dogies name????? oh yaa....and we can all flaunt with happydance !!!! I have also started keeping my nails short. i really cannot manage longer nails. SIgh! Hi Rads!! :) how was your day? Was good..was out with my friend..and you?